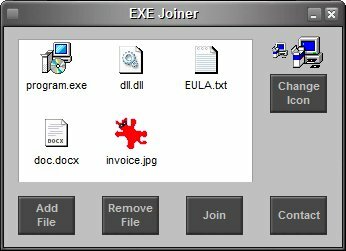 EXE Joiner is a small program that allows you to easily join (bind) two or more files (no matter their type) into one single executable. That executable (the one into which the files are included) is a simple compiled program that, when opened, will automatically launch the included files one by one. Also, it can be used as all types of files converter and encrypter to exe file. EXE Joiner is portable - no installation needed, no need for .NET or any other runtime library. Just unzip on your hard drive and run the program (and to uninstall simply delete it from your hard drive). EXE Joiner is able to run any type of file from the joined file without affecting the file functionality. For instance, let's assume you join an executable and a mp3 file. When the joined file is run, the included executable will run like before being joined while the mp3 file will be opened with the associated mp3 player (Winamp, MediaPlayer etc. ).